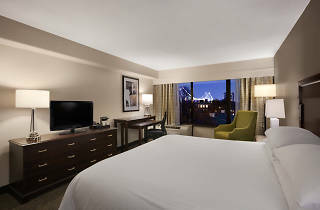 When planning a trip to the City of Brotherly Love, find a room at one of the best cheap hotels in Philadelphia, because there’s so much more to this city than enjoying the view from your hotel room (you can hit up some of the best rooftop bars Philadelphia has to offer for that). Spend your time (and dough) doing the things that matter: like eating your way through the city at some of the best restaurants in Philadelphia or embracing your inner Revolutionary at sites like the Liberty Bell and the National Constitution Center. 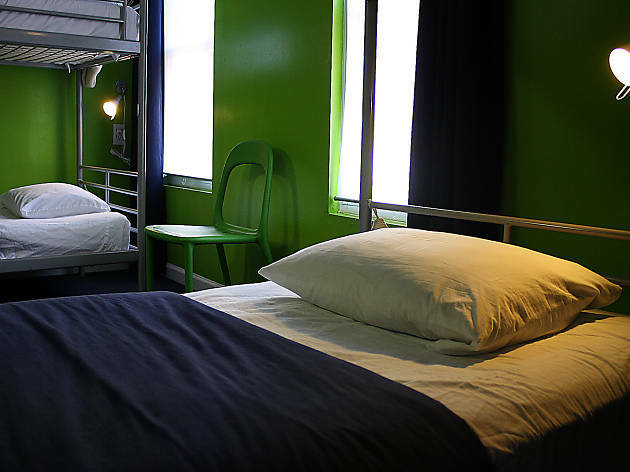 Our guide to the top cheap hotels in Philadelphia includes a mix of chain hotels, hostels and inns that fall under $180 per night—with some, including all the hostel options, being a lot less. Just be sure to book early to lock in the best prices. 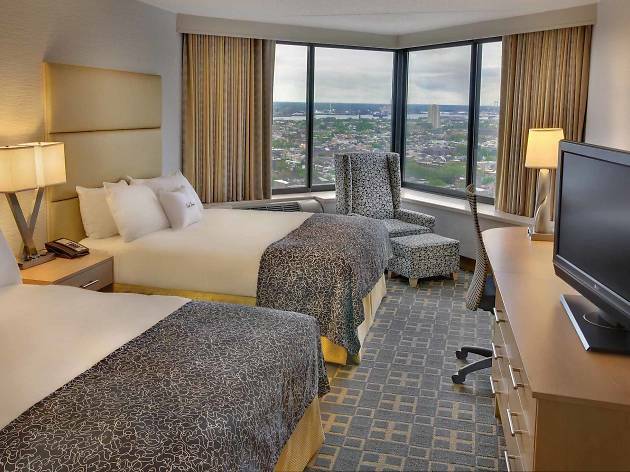 RECOMMENDED: The best hotels in Philadelphia. 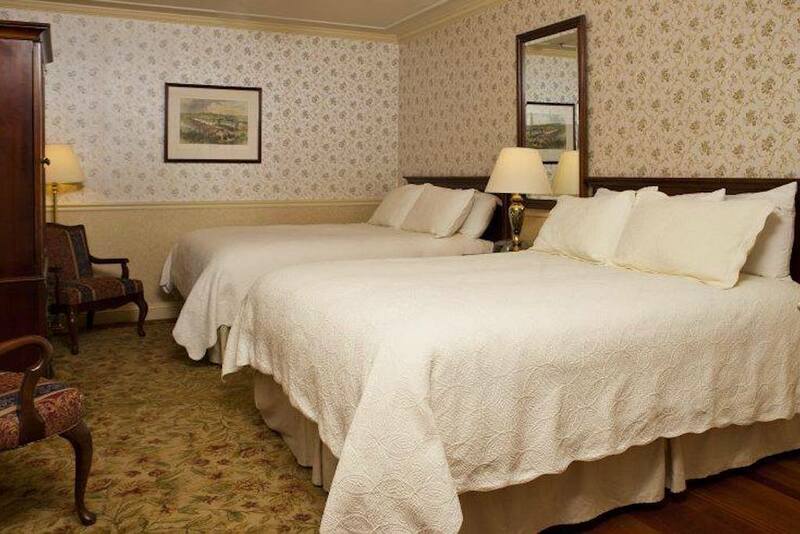 Old school glamor plus all the mod cons await you at this affordable riverside hotel. Log into free wifi while working out in the fitness room. Then get a bite to eat at the onsite Italian restaurant and marvel at the wine cellar. 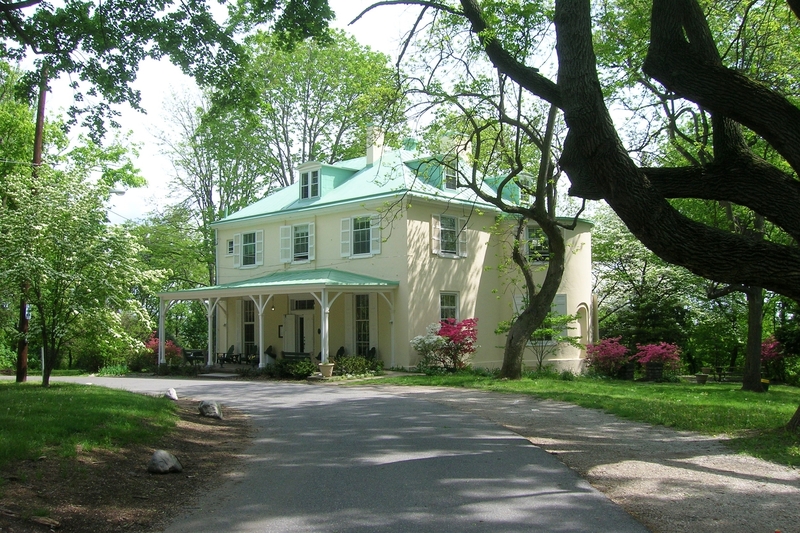 When you’re not enjoying the hotel, there’s plenty to do around Penn’s View. For starters you’ll only be a ten –minute walk the Liberty Bell. You can also check out Spruce Street Harbor Park and the skate rinks (ice and roller, depending on the time of year) at Penn’s Landing. 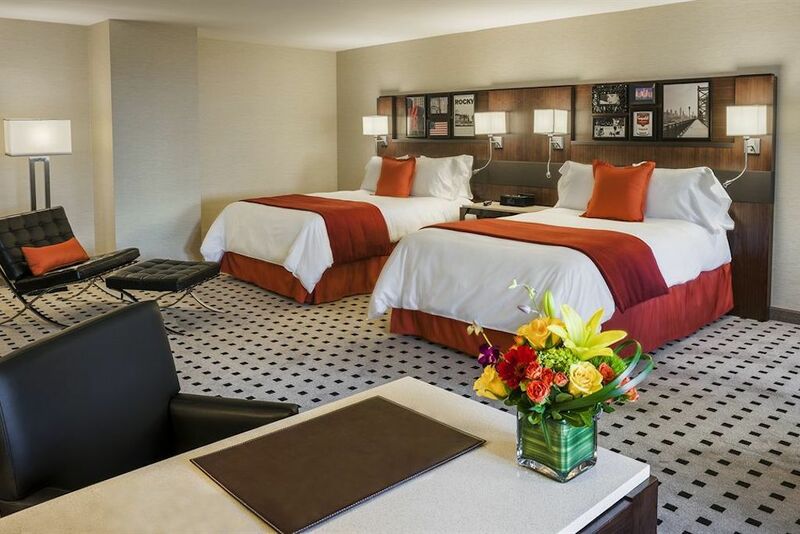 For a real home away from home, you could do a lot worse than Hilton’s Home2 Suites. 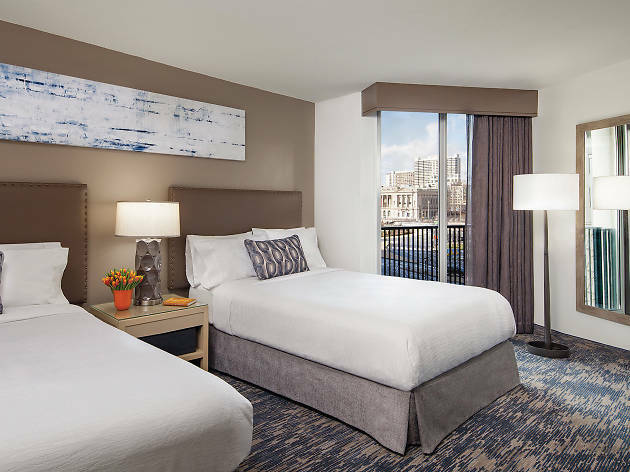 These spacious studios are done up in contemporary décor, in calming shades, and come with everything you need to cook, clean, eat, entertain and sleep. The kitchenettes are equipped with fridges, microwaves, dishwashers, coffee makers, toasters and more. 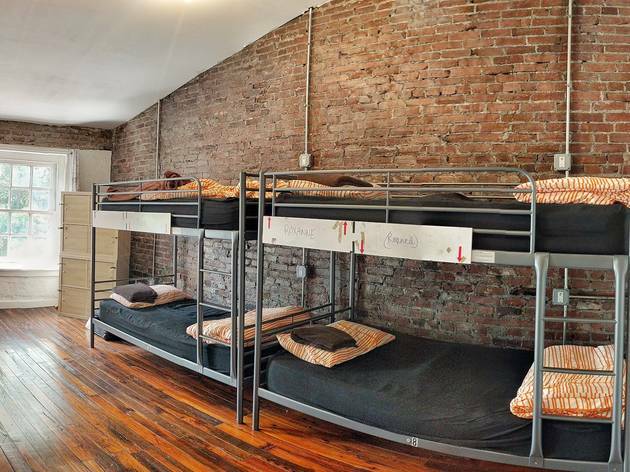 There are separate work spaces, a flat screen in the living area, and pets are allowed for an extra fee. Elsewhere in the building you’ll find a saltwater pool, gym and daily hot breakfast. 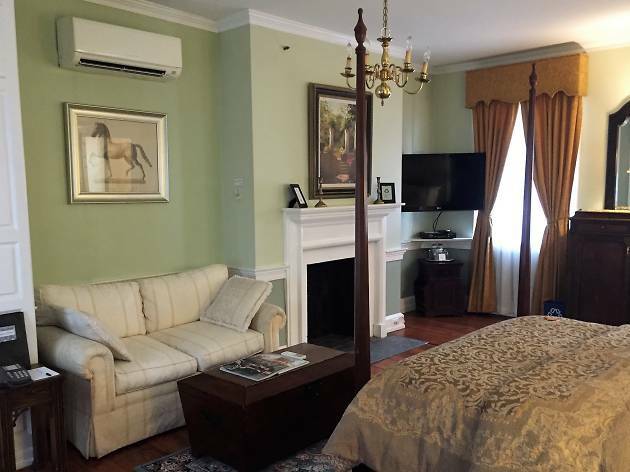 Dating back to 1787, this colonial boutique hotel holds a fair amount of history and is surrounded by it too. Just a block away you’ll find Washington Square Park and the 1753 Georgian Independence Hall. But even if you stay in the hotel, you’ll feel a sense of its grand past as you wander through the ornate library, romantic courtyard and elegant restaurant. 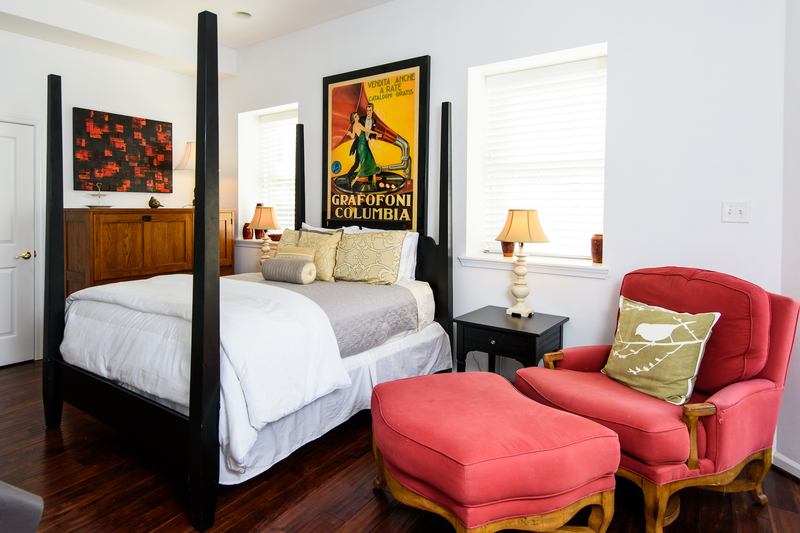 The rooms, while decked out in Revolutionary charm, include all the mod cons. 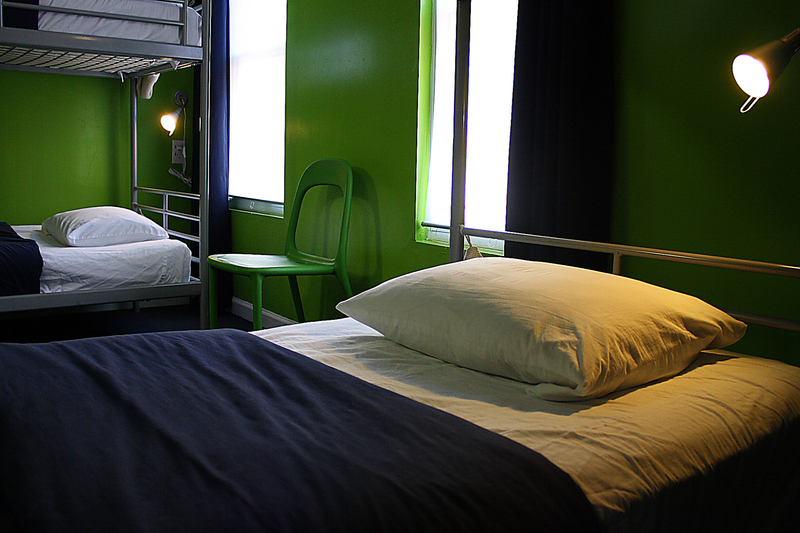 Think iPod/iPhone docks, flat screen TVs, free wifi and coffee/tea making facilities. 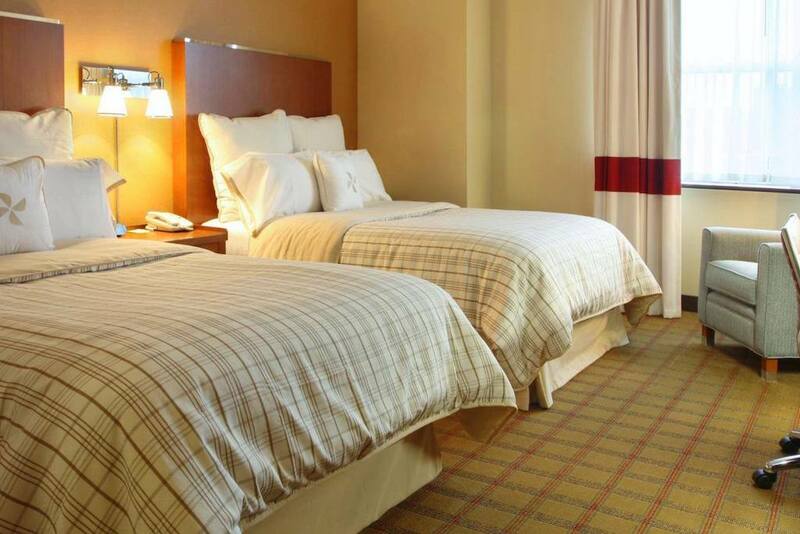 Hold back more bucks for sightseeing and having fun by saving on your stay. 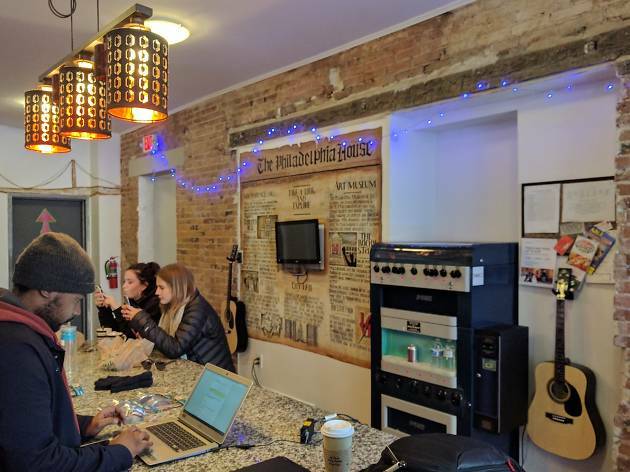 City House Hostels have two locations, but this N 2nd Street one is not only in a beautiful nineteenth century townhouse, it’s also super close to top attractions like Independence Hall, National Liberty Museum and the Pennsylvania Convention Center. 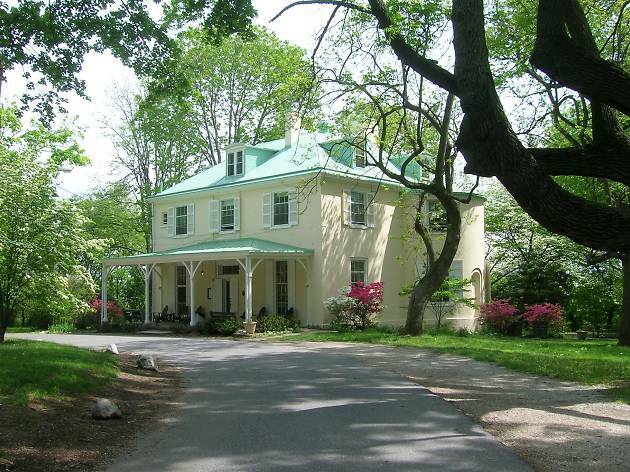 Plus it’s only a 15-minute drive to Philadelphia Internation Airport. Pretty much every area is shared here, so only sociable types need apply. 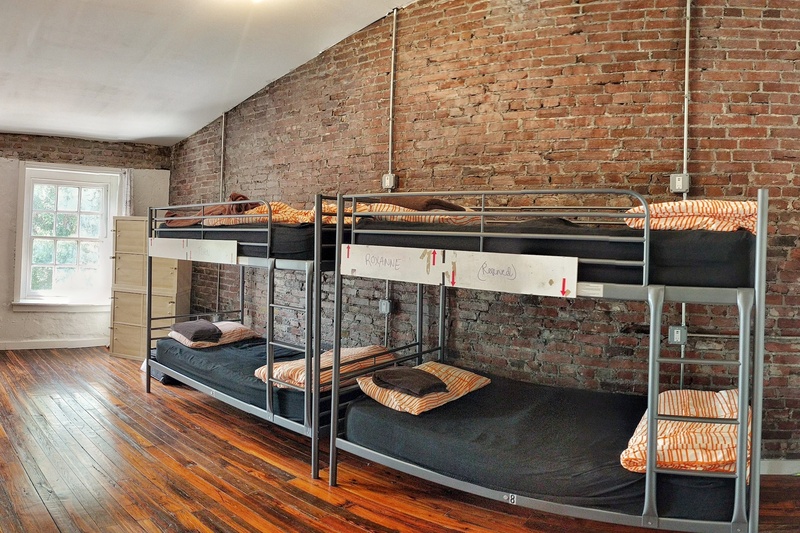 The clean dorms have bunk beds and free wifi, while elsewhere you’ll find bathrooms, the kitchen and games room. 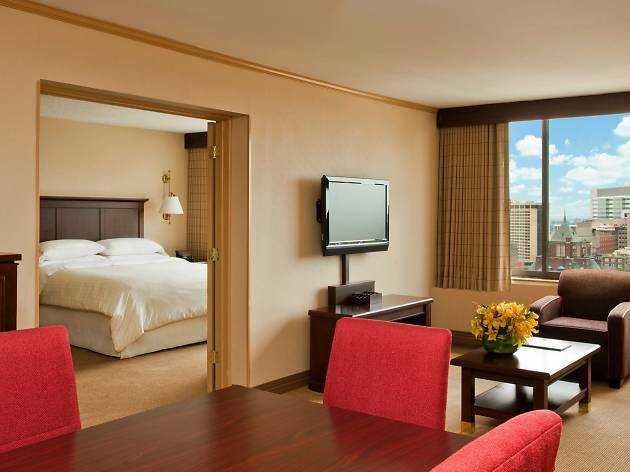 This boutique hotel is close enough to all the action of Center City without all of the congestion. 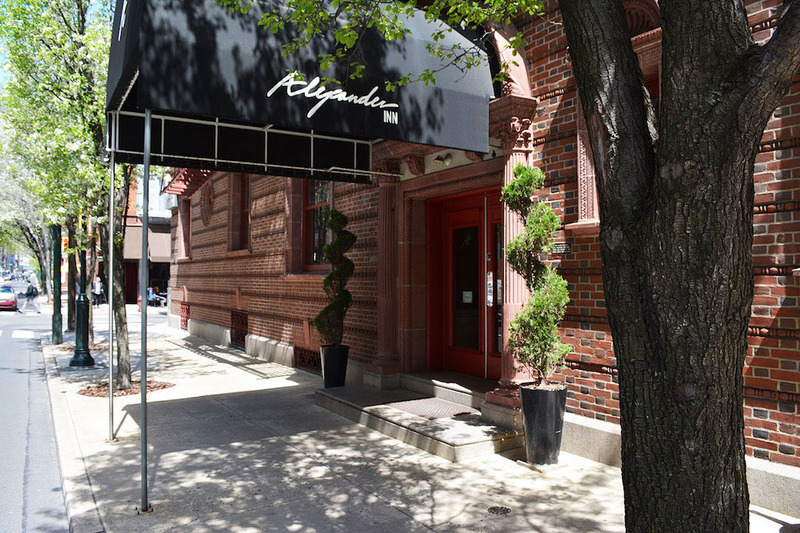 Conveniently nestled amidst some of Midtown Village’s best restaurants (excellent Italian eatery Little Nonna’s resides on the hotel’s ground level) you’ll never be far from an exceptional meal. 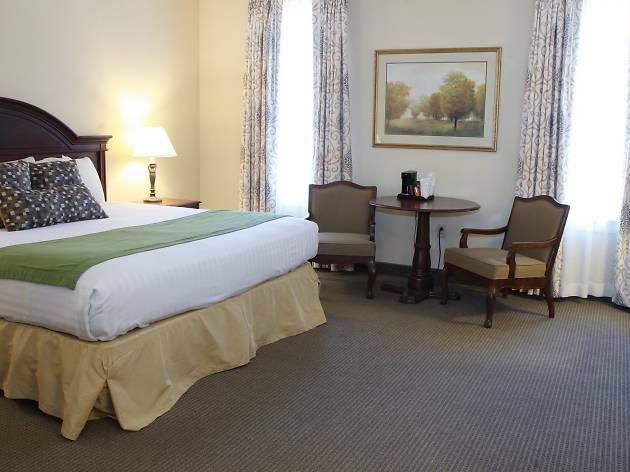 Each of the hotel’s 24 guestrooms feature quaint design and decor inspired by the Georgian Revival-style building, hardwood floors and dark wood furniture and accents. 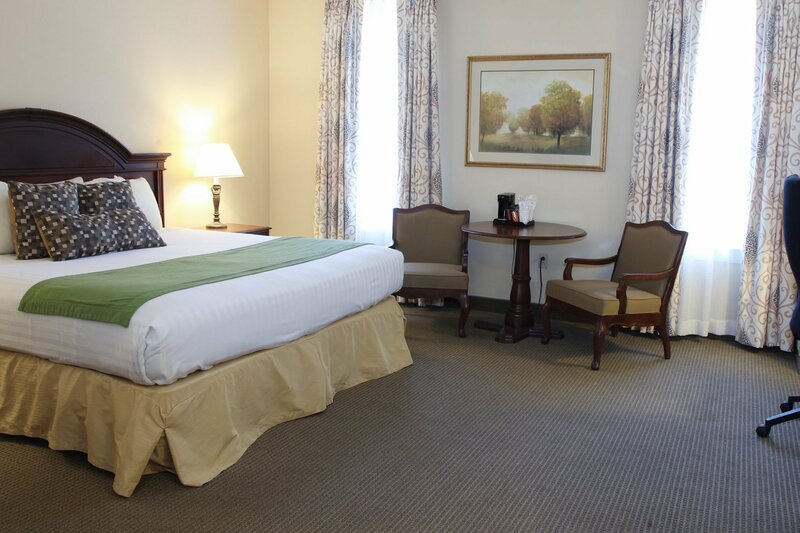 The Independent features comfort within a bustling downtown area with perks like free wifi and breakfast. 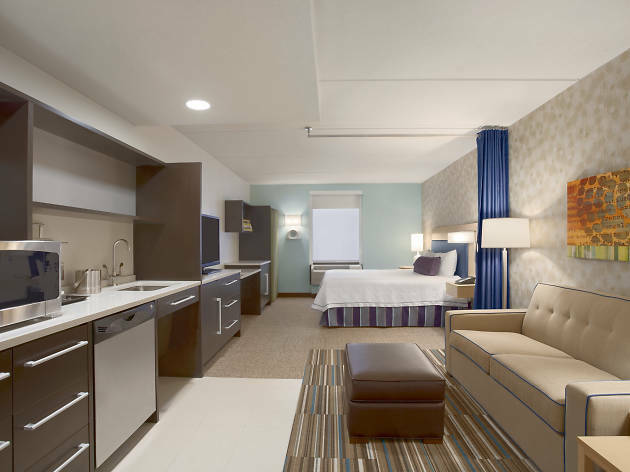 Contemporary and metropolitan, Club Quarters is the epitome of a downtown experience. 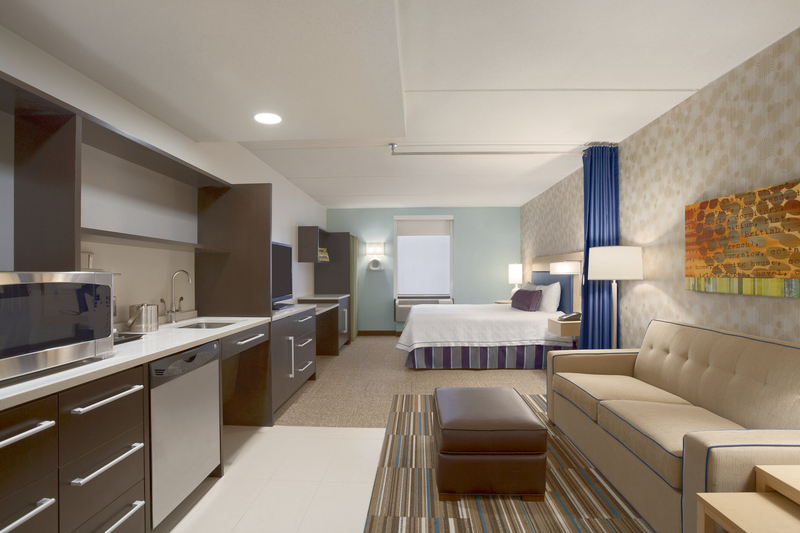 Rooms are equipped with a desk, while larger rooms feature kitchenettes. 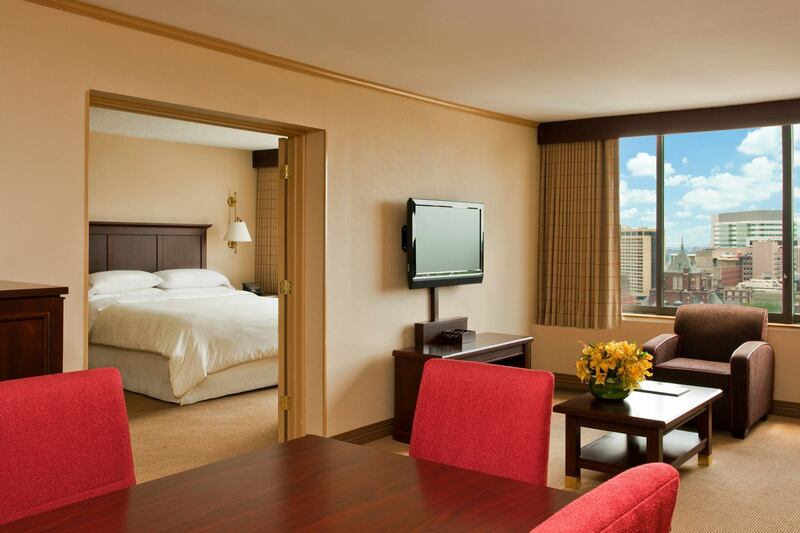 The large lobby and club living room are great for both business and casual hangs. The in-house Davio’s Northern Italian Steakhouse will make your fancy stay feel even fancier. Plus, enjoy the splendors of Center City eats and nightlife: Federal Donuts, Continental Midtown, Dan Dan, Rumor, Tria Taproom and more. Experience a neighborhood complete with its own unique personality, shopping and dining offerings. 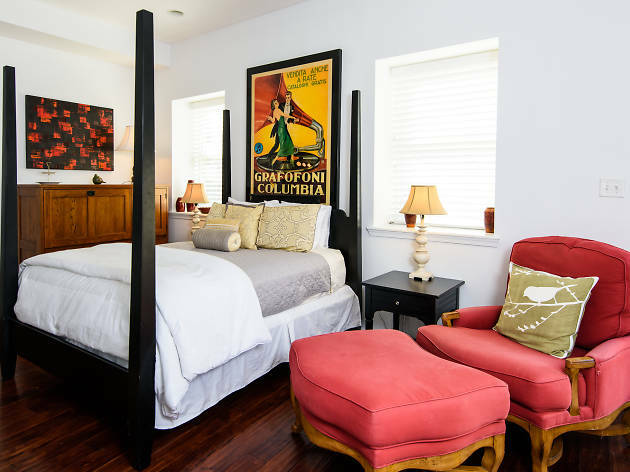 Away from the historical artifacts and downtown bustle, Manayunk Extended Stay is located near Main Street (home to all those aforementioned shopping and dining destinations) and the Manayunk Canal, ideal for a scenic walk or bike ride. 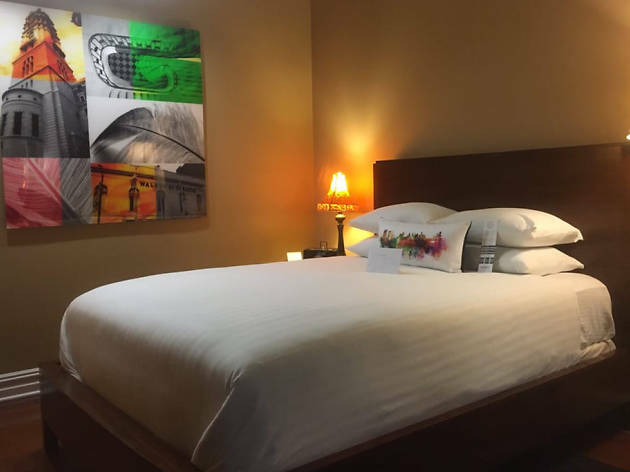 Available for a minimum stay of two weeks, each suite comes complete with a kitchenette, living room, balcony, private bathroom and includes housekeeping. 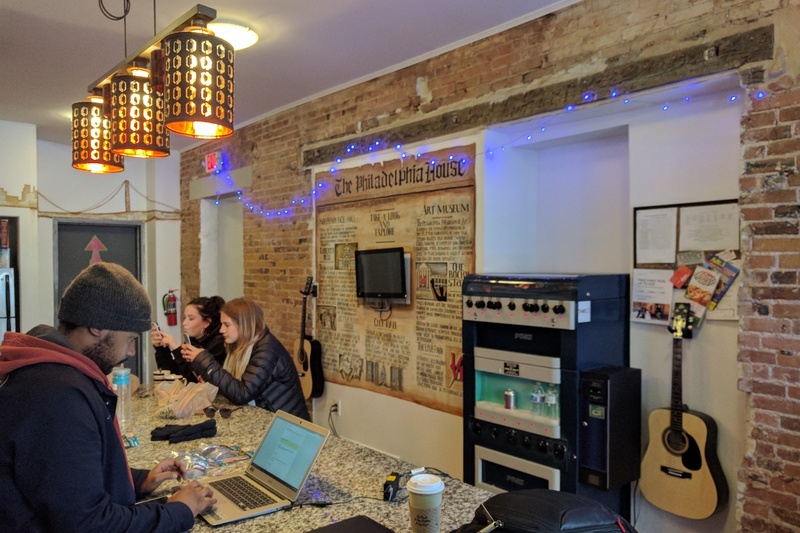 Smaller than the City House Hostels Liberty Bell location, this quaint, red-bricked hostel features the same friendly feel with communal areas, hardwood floors and options of staying in a private, four-bed, eight-bed or 12-bed room. The same rules apply to this locale: quiet hours begin at 10pm and you’ve got to have proof you’re a traveler. Nearby attractions include Ben Franklin’s grave, the National Constitution Center and the National Museum of American Jewish History. 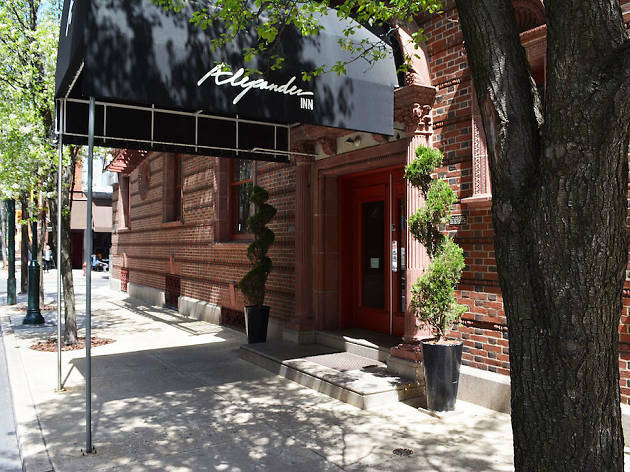 It’s the little things at the Alexander Inn—like the red brick facade, oak wood moldings, stained glass windows and fireplaces—that add to its appeal. 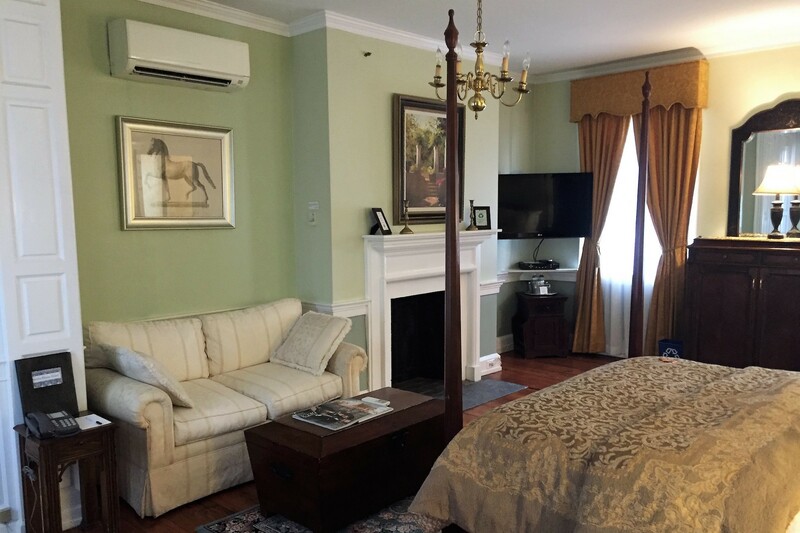 The larger things, like centralized location between the historic attractions in Old City and the fine dining and nightlife establishments in Washington Square West add to the old-school cozy comfort. 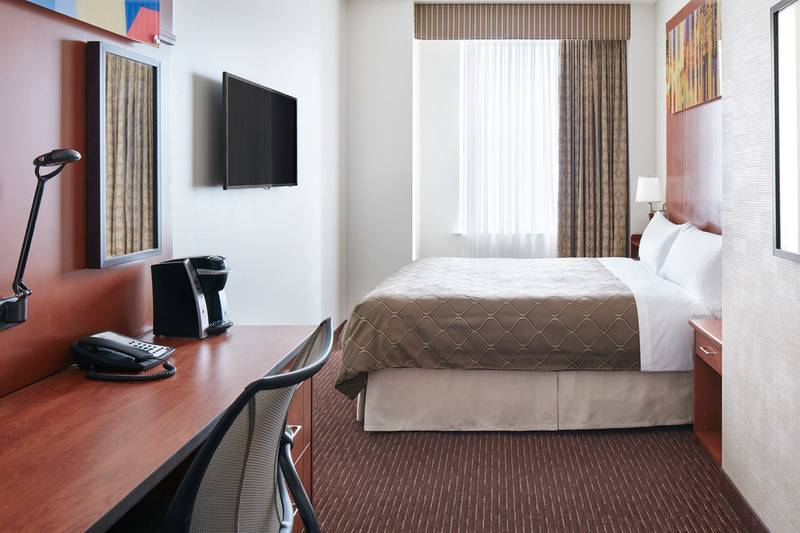 At the hotel, you’ll get standard amenities, such as continental breakfast and a fitness room, with the added perk of being within walking distance of A-plus eateries like Vetri, Vedge and Greenstreet Coffee Co. 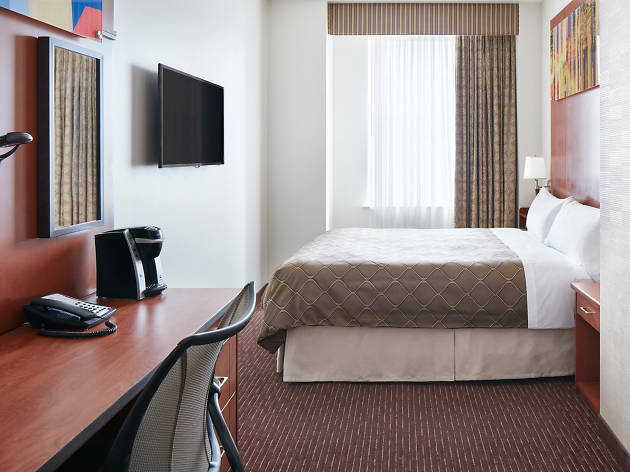 Perfect for campus visits, this hotel neighbors nearby University of Penn, Drexel University and University of the Sciences. For summertime stays, take a dip in the heated outdoor pool. Grab a bite on the hotel’s ground-floor Chinese restaurant, Sang Kee Noodle House. 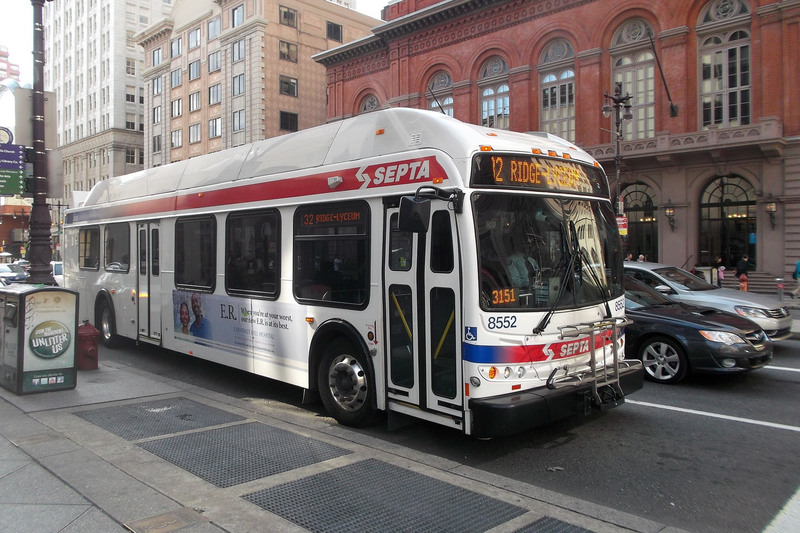 Close enough to 34th Street SEPTA station and 30th Street Station, getting to and from Center City (and beyond) is a breeze. 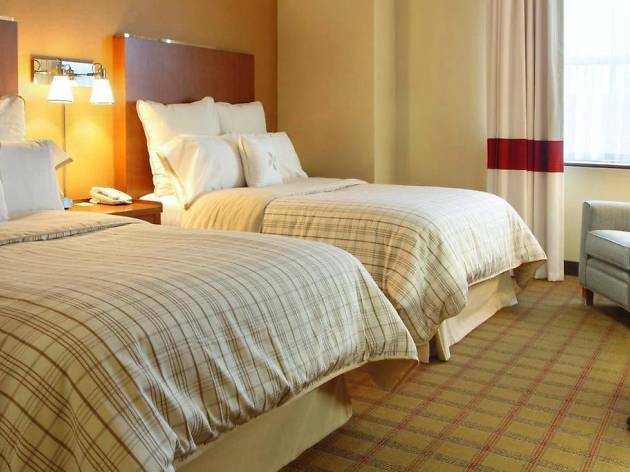 Expect all the usual amenities, like free wifi and a fitness center. 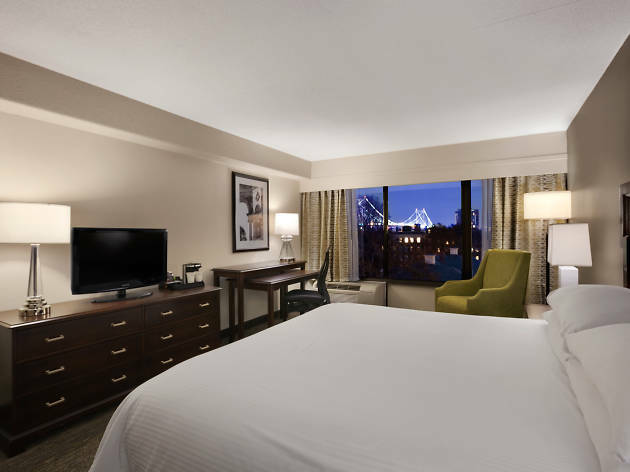 Closer to the museum area than Old City, the Embassy Suites offers enough space for families with two-room suite offerings. The kids can watch TV while parents grab a few minutes of shut eye during a midday break. 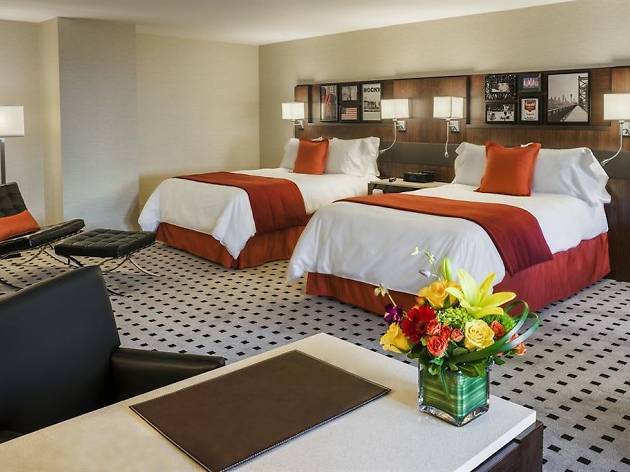 Other perks include an on-site convenience store, fitness area, breakfast buffet with an omelet station and a kitchenette in all suites for any meal prep you’d prefer to do yourself. 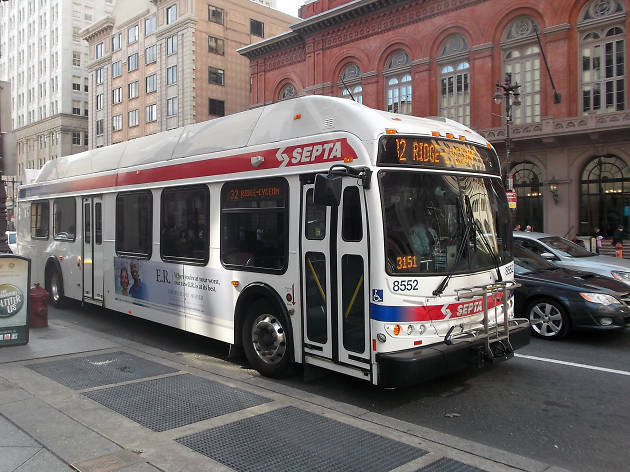 Art lovers can walk down the Parkway and you’ll pass the Barnes Foundation, Rodin Museum and the Philadelphia Museum of Art. If it’s summertime, check out the pop-up park the Oval just below the steps of the art museum, with a beer garden and games for kids. 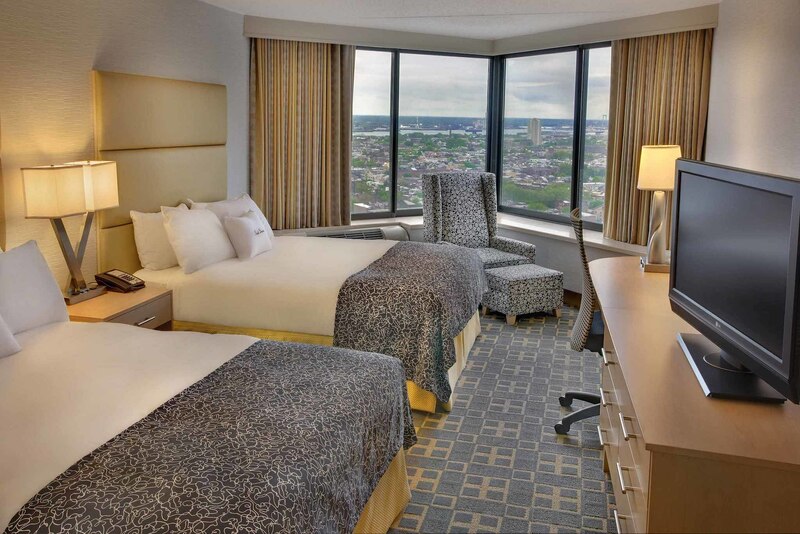 The official hotel of Temple University provides convenient accommodations to those visiting the school or nearby Temple University Hospital and thus offering access to less-visited neighborhoods like Northern Liberties and Fairmount and the campus itself. 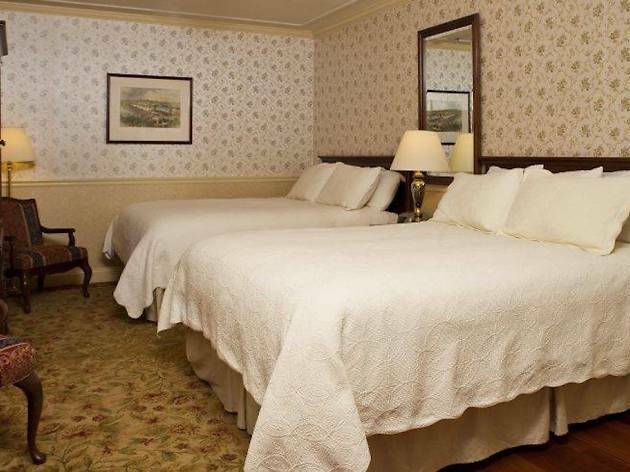 The 22 guest rooms are outfitted with quaint furnishings and the hotel has on-site parking, but make sure to reserve a spot ahead of time. Grab a bite from campus food trucks to get the full college experience. 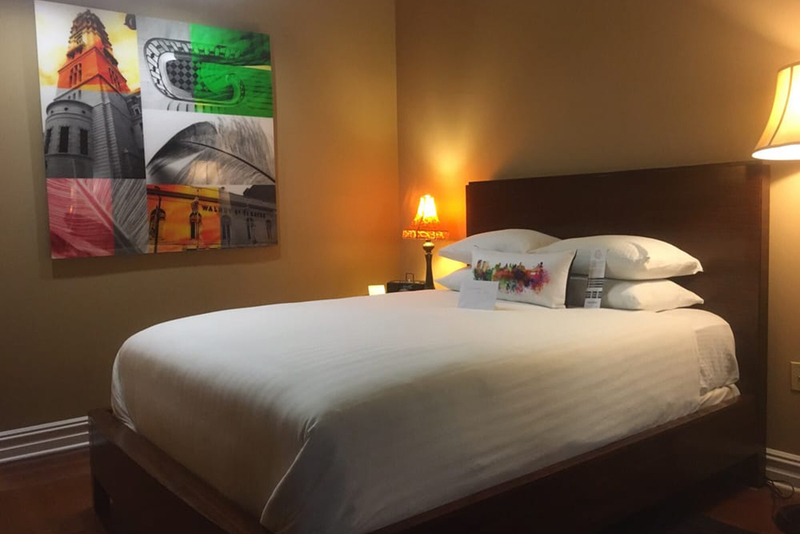 Across the street from the Pennsylvania Convention Center, this hotel is the spot for those on business to recharge while also having the convenience of location to Chinatown and Center City. 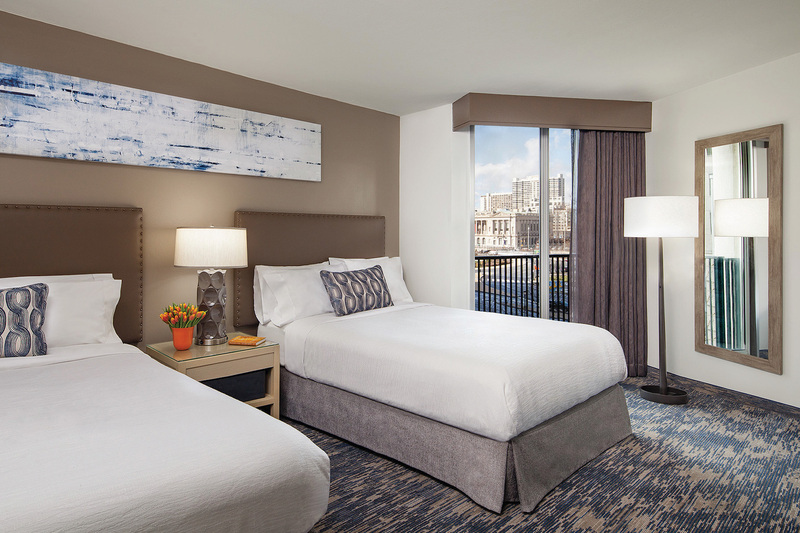 Featuring all the standard amenities like free wifi, a fitness room and in-house bar and restaurant, you’ll have everything you need—plus the added perk of being able to hop over to Dilworth Park or grab some pho in Chinatown. Need help getting around the city?